Where we've been, where we are and where we're going. During the last year, Insyte Partners has guided our community through a dynamic and intense sensing, learning and visioning Journey. Through our Planning Team, Vision Team, Board, listening forums, deep dives, learning journeys and prototype boot camp, we have engaged over 350 members in this process. We want to thank everyone who has participated. You committed your time, energy and shared your own Jewish journeys, hopes and dreams and communal aspirations for our shul. This has been a huge endeavor, and would not have been possible without so many of you stepping up, and participating fully, in every way. From all of the data collected and our collective conversations, a strategic plan is currently being written to support our Framework for Action (see below) and give language to the six “pillars” that guide Beth El's future. We are in the process of transitioning from Journey's planning team to a newly formed Beth El Implementation Team. This team will guide, monitor progress and hold the intent of the vision that emerged from Journey as we move to implementation. ​​​​​​​ The Implementation Team will meet regularly and will coordinate with the board and staff to ensure everyone is aligned on our vision and mission. Implementation Team to review draft strategic plan. Strategic plan to be presented to the Board of Trustees. Continued communication to the congregation. Sanctuary renovation planned to be complete (a big first tangible step in realizing our vision!). Prototypes initiated by passionate congregants will be fleshed out, launched, morphed, abandoned and grown! A Journey update on our progress will be brought to the congregation at the annual meeting on May 15. 6. Develop an Operations Think Tank for Project “Implementation made ridiculously simple.” – a how to guide for getting things done at Beth El. If you are interested in working with one of these prototype teams, learning more about them, or have another prototype that you would like to launch, or if you have questions about our Journey process or the plans going forward please reach out to journey@bethelnr.org. We want your help! We are grateful for all of you who have supported and been involved in Journey. 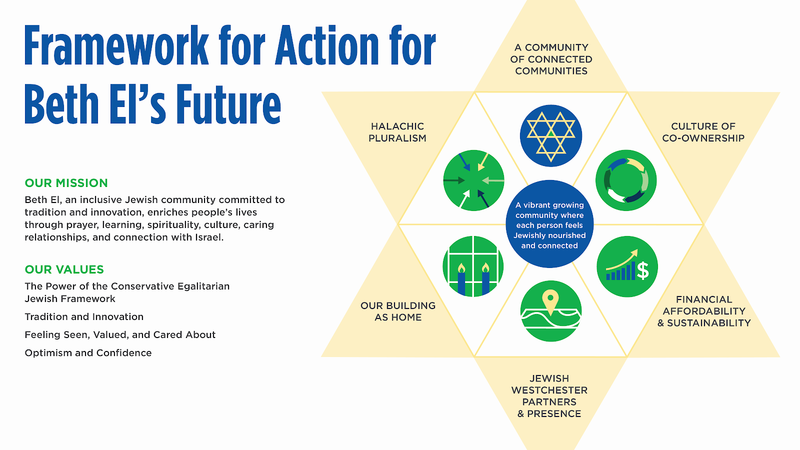 For those of you watching from the sidelines, now is a great time to jump in to Beth El's future. Journey was more than just a strategic planning process. It was an important milestone in our journey to build a vibrant future together. In order for us to build that future, we need you, your ideas, your energy, your voices, your ears and your vision. We can't do this without you! Thank you in advance for your participation and support. Click here to see the image enlarged.